We've just released two new microtransactions, designed in a community-favourite theme: the Celestial Aura Effect and Celestial Soulrend! The Celestial Aura Effect changes the standard effect of aura gem to a cosmic one with moving particles. Celestial Soulrend replaces the effect of this new, but already popular skill gem, with a purple and yellow Celestial effect. Check out these microtransactions by watching their videos below, or click here to get yours. Both of these work great with any celestial microtransactions from the store, such as the Celestial Armour Set, Celestial Character Effect, Celestial Hood and the Celestial Weapon Effect. 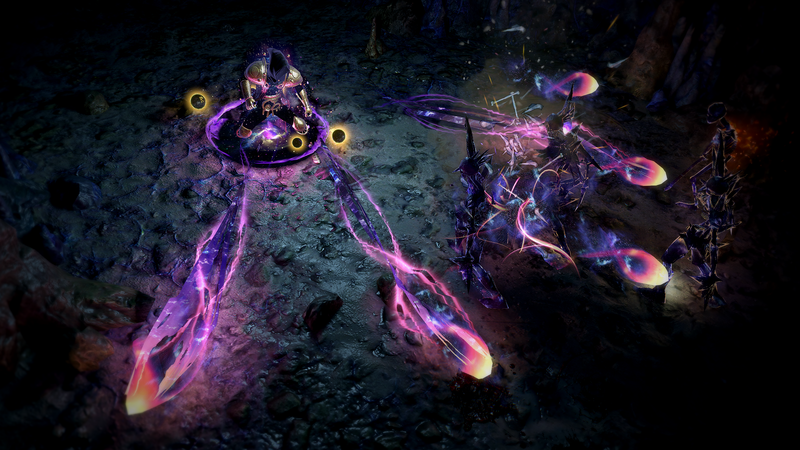 GGG - Please make the Templar Lab Zana's hideout. That place is pretty. sense, reason, and intellect has intended us to forgo their use. Soulrend is sick but I need to hold out for the cats I think. Also, boxes when? Not bad. Might get these in a sale. MONEY, MONEY, MONEY, EVERYONE AND THEIR DOGS ONLY TALK ABOUT MONEY!!! What is this no cat garbage. Edit: I read and saw cats. I'm much happier now. wow I can see that aura conforming to the terrain in the staircases. That's new right?